The Portsmouth Fleet is the birthplace of new fleets, the mixing pot of “dinghy” and centerboard boat designs, and often the first port for new AYC Members to begin racing. …and any other non-One-Design boats that happen to show up! 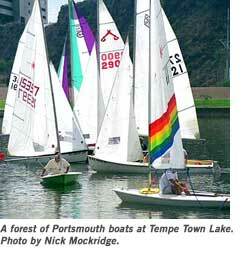 In the spirit of mixing it up, Portsmouth welcomes all AYC members to participate in Lake Pleasant and TTL small boat activities regardless of boat design, skill level, or lack of boat. 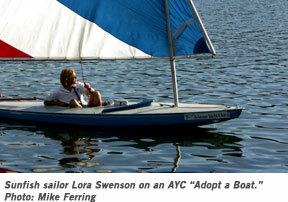 Yes, you can adopt a Sunfish and sail in the Portsmouth fleet at Tempe Town Lake. If you can tell time and have an e-mail address (or not), you are a Portsmouther. Come on out and join the fun! Check with Fleet Captain Joe Motil with any questions you have.